1. 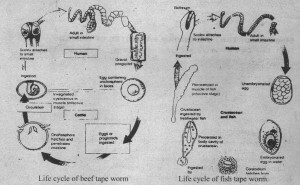 Mouth and digestive system is absent in tape worms. They absorb nutrients directly from the host. 2. Most adult tapeworms consist of proglouids. The proglottids are a long Iseries of repeating units. 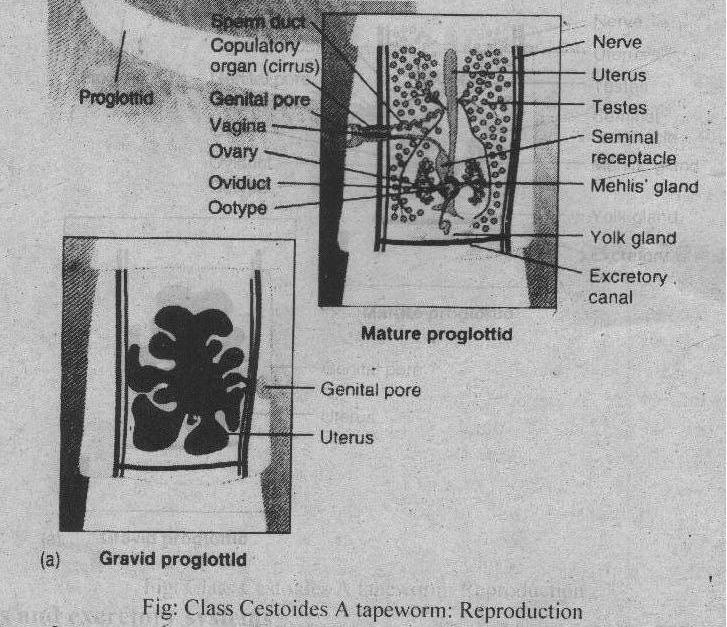 Each proglottid contains a complete set of reproductive Istructures. 3. The adult tapeworms live in a very stable environment. There are no environmental variations . in vertebrate intestinal tract. Therefore, tapeworms do not required special structures. The physiology of the host maintains the homeostasis of tapeworm. 4. 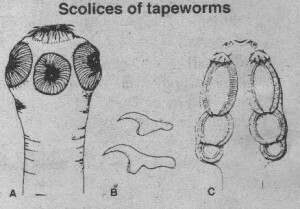 Tape worms have lost many complex structures due to parasitic mode of life. So they have evolution from complex to simple. 1. Only one set of both male and female reproductive organs are present in it. 2. Some animals bear suckers. 3. Their bodies are not divided into proglottids like other cestodes. 1. Absence of digestive system. 3. Presence of parenchymal muscle cells. These are not present in an other platyhelminths. The presence of all these structures suggests strong phylogenetic affinities with other cestodes. Almost all of the cestodes belong to the subclass Eucestoda. They are called true tapeworms. They show high degree of specialization for parasitic life. Their body is divided into three regions. 1. Scolex: It is present at one end. 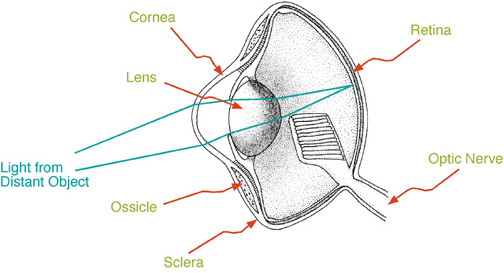 Scolex is a hold-fast structure. It contains circular or leaf like suckers. Sometimes. they also have hooks. The tapeworm firmly anchors itself to the intestinal wall with the Scolex. Mouth is not present in them. 2.Neck: The scolex narrows to from the neck. 3. Strobila : It is the third body region. The strobila consists of a series of linearly arranged proglottids. Proglottids function primarily as reproductive units. As a tapeworm grows, new proglottids are added in the neck region. The older proglottids are gradually pushed posteriorly. The posterior proglottids mature and start producing eggs. Anterior proglottids are immature. They are mature in the mid region of the strobila. ‘[he proglottids at the posterior end accumulate eggs. So they are gravid (ripened). The outer body wall of tapeworms consists of a tegument. The tapeworms have no digestive system. Therefore tegument plays an important role in nutrient absorption. The tegument even absorbs some of the host’s own enzymes. These enzymes help in digestion. 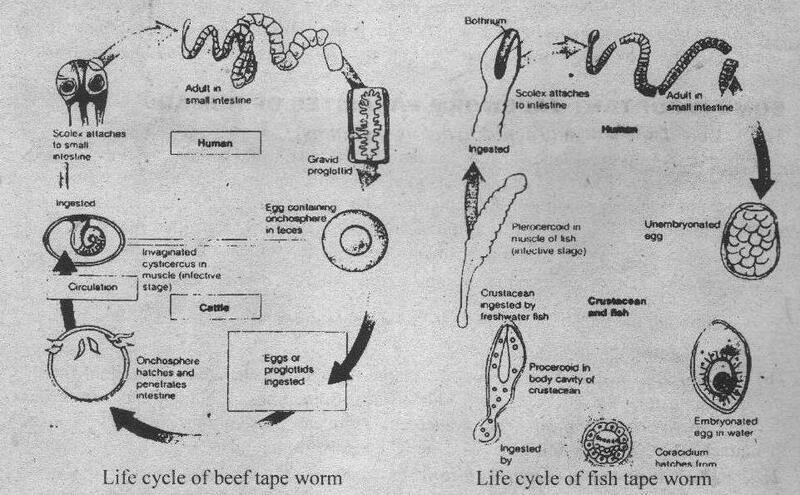 The body systems of tapeworms are reduced in structural complexity except reproductive systems. The nervous system consists of only a pair of lateral nerve cords. These nerves arise from a nerve mass in the scolex. They extend in the length of the strobila. A protonephridial system also runs the length of the tapeworm. Tapeworms are monoecious. They produce large number of eggs. Each proglottid contains a complete set of male and female reproductive organs. 1. Male reproductive organs: Numerous testes are scattered throughout the proglottids. Testes produce sperm. These sperms move into the copulatory organ cirrus through a duct system. The cirrus opens through a genital pore. The male system of a proglottid matures before the female system. Therefore, copulation occurs with another mature proglottlid of the same tapeworm or with another tapeworm in the same host. Thus cross fertilization produce hybrid vigor. 2. Female reproductive organ: There is a single pair of ovary in each proglottid. It produces eggs. Sperm are stored in a seminal receptacle. They fertilize eggs as the eggs move through the oviduct. Then egg passes through the vitelline gland. Then the eggs pass into the ootype. The ootype is an expanded region of the oviduct. It forms capsules around the eggs. The ootype is also surrounded by the Mehlis’ gland. This gland helps in the formation of the egg capsule. Most tapeworms have a blind- ending uterus. The eggs are stored in the uterus. 3. Development: The reproductive organs degenerate after storage of egg. Therefore, gravid proglottids are called as “bags of eggs”. The gravid proglottids break and get free from the end of the tapeworm. They pass from the host with the host’s feces. In some tapeworms. the uterus opens to the outside of the worm. Thus the egg is released into the host’s intestine. The proglottids are not continuously lost. Therefore the adult tapeworms become very long. (a) Onchosphere: The egg develops and forms a six-hooked larva called onchosphere. The cattle graze in pastures contaminated with human feces. They ingest oncospheres. Digestive enzymes of the cattle free the oncospheres. Larva bore through the intestinal wall with its hooks and moves into the blood. Blood carries the larvae to skeletal muscles. (b) Cysticercus: onchosphere forms cyst in the muscles. It changes into a fluid-tilled ladder called a cysticercus or bladder warm. Sometimes, a human eats a raw or improperly cooked meat. The cysticercus is released from the meat. Its scolex attaches to the human intestinal wall, and the tapeworm matures. Its interrmediate host is the pig. The strobili are 10 m long: The pathology is more serious in the human than in the pig. Gravid proglottids before release of oncospheres before removal of progloottids from the intestine of host. The larvae hatch. –Hiev move through the intestinal wall and enter the bloodstream. Therefore, they are distributed throughout the body. The causes disease cysticercosia. It can be fatal if the cysticerci encysted in the brain. It is common in the northern parts of North America and in United States. This tapeworm has a scolex. The scolex has two longitudinal grooves called bothria. Bothria act as hold-fast structures. The adult worm may attain a Length of 10 m. Many proglottids release eggs through uterine pores. The eggs are deposited in freshwater. It forms following larvae. 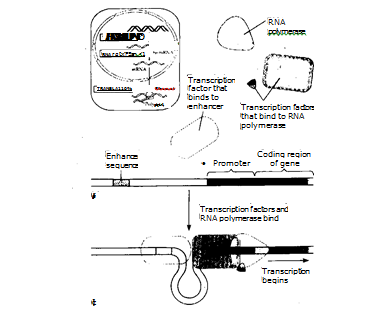 (a) Coracidia: The eggs are hatched and a ciliated larvae coracidia (sing., coracidium) is formed. These coracidia are ingested by copepods. (b) Procercoids: The coracida shed their ciliated coats in the copepods. It develops into procercoid larvae. Fish eat the copepods. (c) Plerocercoid: The procercoids burrow into the muscle of the fish and become plerocercoid larvae. Larger fishes that eat smaller fishes become similarly infected with plerocercoids. When human eat raw, or poorly cooked meat, it enters into the intestine. The plerocercoids attach to the small intestine and it grows into adult worms.